Metatron is the name of an angel in Judaism and some branches of Christian mythology. There are no references to him in the Jewish Tanakh or Christian Scriptures (New and Old Testament). Although he is mentioned in a few brief passages in the Talmud, Metatron appears primarily in medieval Jewish mystical texts and other post-scriptural esoteric and occult sources. In Rabbinic tradition, he is the highest of the angels and serves as the celestial scribe. In Egyptian mythology Metatron was Thoth the Scribe. According to Ancient Alien Theory, gods and the angelic kingdom were extraterrestrials. There is no consensus as to his genesis or the role that he plays in the hierarchy of Heaven and Hell. A mysterious figure, Metatron is identified with the term, "lesser YHVH" which is the Lesser Tetragrammaton - in a Talmudic version read by the Karaite scholar Kirkisani. 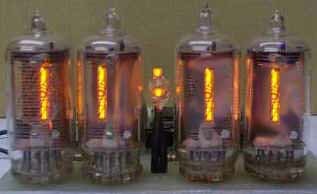 The word 'Metatron' is numerically equivalent to Shaddai according to Hebrew gematria, therefore he is said to have a "Name like his Master". The Talmud records an incident with Elisha ben Abuya, also called Aher ("another"), who is said to have entered Paradise, and saw Metatron sitting down (an action in heaven that is permissible only to God Himself). Elisha ben Abuya therefore looked to Metatron as a Deity, and is reported to have said, "There are indeed two powers in heaven!" The rabbis explain that Metatron was allowed to sit because of his function as the Heavenly Scribe, writing down the deeds of Israel, just as Thoth was the Egyptian scribe. According to one school of thought Enoch was taken by God and transformed into Metatron, explaining the mysterious passage "Enoch walked with God; then he was no more, because God took him away (Genesis 5:24 NIV). However, this viewpoint is not shared by many Talmudic authorities. There may be two Metatrons, one spelled with six letters, and one spelled with seven. 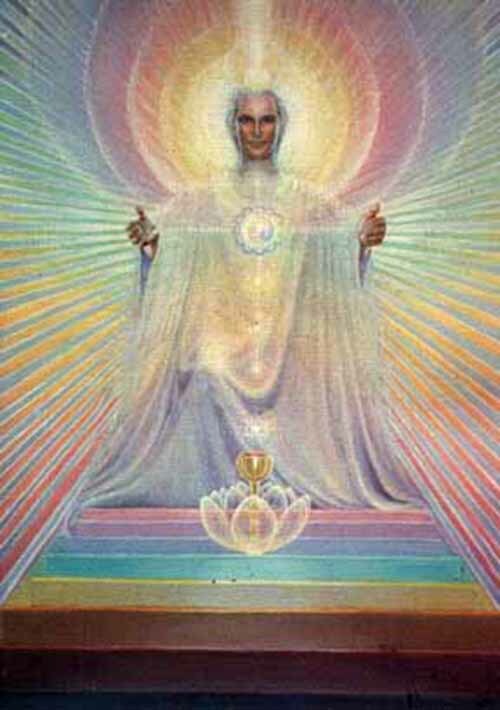 The former may be the transformed Enoch, while the latter is the Primordial Metatron. The Zohar calls Metatron "the Youth", identifies him as the angel that led the people of Israel through the wilderness after their exodus from Egypt, and describes him as a heavenly priest. Metatron is also mentioned in the Pseudepigrapha, most prominently in the Hebrew Book of Enoch (also called Third Enoch), in which his grand title, "the lesser YHVH" resurfaces. According to Johann Eisenmenger, Metatron transmits the daily orders of God to the angels Gabriel and Samuel. Metatron is often identified as being the twin brother to Sandalphon, who is said to have been the prophet Elijah. This complex Sacred Geometry structure called Metatron's Cube, is derived from the ancient structure of the Flower of Life. It is named after the Archangel Metatron. 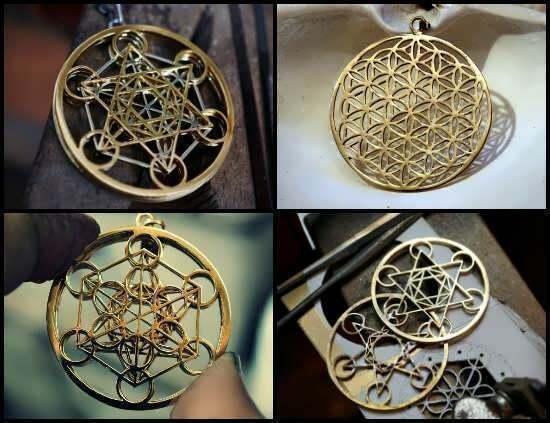 Check out Metatron's Cube Pendants and Fine Jewelry, and Flower of Life Pendants. Learn more about Metatron's Cube. 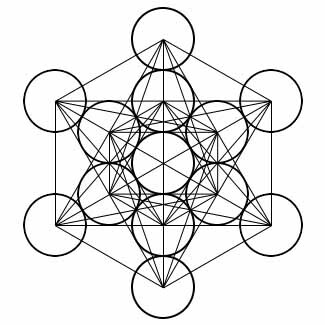 Metatron's Cube is a two-dimensional geometric figure created from 13 equal circles with lines from the center of each circle extending out to the centers of the other 12 circles. Six circles are placed in a hexagonal pattern around a central circle, with six more extending out along the same radial lines. Metatron's Cube shares 2-D resonance with the Flower of Life. It is a sacred geometry figure. Its name makes reference to Metatron, an angel mentioned in apocryphal texts including the Second Book of Enoch and the Book of the Palaces. These texts rank Metatron second only to YHVH in the hierarchy of spiritual beings. The derivation of Metatron's cube from the tree of life, which the Talmud clearly states was excluded from human experience during the exile from Eden, has led some scholars (including Johann Andreas Eisenmenger) to portray Metatron as the means by which humanity was given knowledge of YHVH; presumably implying that study of Metatron's cube would be necessary to understanding the tree of life. The pattern delineated by many of the lines can be created by orthographic projections of the first three Platonic solids. Specifically, the line pattern includes projections of a double tetrahedron (aka stellated octahedron), a cube within a cube (a three dimensional projection of a tesseract), and an octahedron. Although the image below shows the dodecahedron and the icosahedron fitting the pattern of Metatron's Cube, the vertices of those shapes do not coincide with the centers of the 13 circles (the icosahedron projection in the image below is false). The Flower of Life has thirteen circles. If each circle's center is considered a "node", and each node is connected to each other node with a single line, a total of seventy-eight lines are created. Within this cube, many other shapes can be found, including two-dimensionally flattened versions of the five platonic solids. In early Kabbalist scriptures, Metatron supposedly forms the cube from his soul. This Cube can later be seen in Christian art, where it appears on his chest or floating behind him. Metatron's cube is also considered a holy glyph, and was often drawn around an object or person to ward off demons and satanic powers.